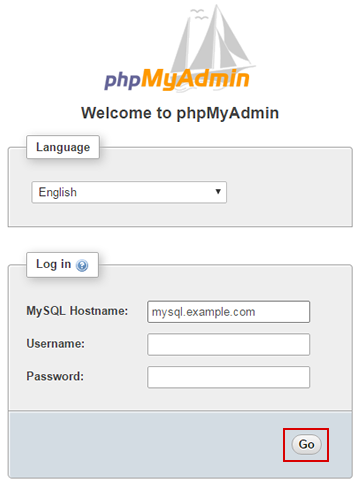 Your database credentials allow you to log into your database in the panel using phpMyAdmin. phpMyAdmin is a graphical interface where you can navigate through your database and make changes. These same credentials can also be used to connect to the database using any software you like. Make sure you only log into your database if you know exactly what you need to adjust. Any misconfiguration in your database could potentially cause your site to not operate properly. If your nameservers are hosted at DreamHost, proceed with the steps below. If you just installed a One-Click Install (and your nameservers are pointed to DreamHost), you will need to wait a few hours for the new mysql subdomain to update. Once the DNS has propagated online, your site will connect to your database. If your nameservers are NOT hosted at DreamHost, you must create an A record (at your current hosting company) for your 'mysql.example.com' hostname to point to DreamHost. Only after that mysql A record updates would the phpMyAdmin link in your panel function. View the following article for instructions on how to locate your DreamHost A record. You can then contact your current hosting company to add it to their system. You only need to create the A record for your mysql subdomain such as 'mysql.example.com'. Alternatively, you can use the East and West coast data center hostnames under Step #4 below to log in. Visit the MySQL Databases page and scroll down to the section titled 'Databases on this server'. Below you'll see a listing of your databases. If you installed a One-Click Install from the panel, you'll see its name under the 'Description' column. If you have multiple databases, you'll need to identify the one that corresponds to your website. This can usually be found in the site's configuration file, but every application puts this in a different location. Consult your application's knowledge base for configuration file locations. The specific username tied to the database is listed to the right of your databases. Make a note of this. On the next page, click the Show button to view the user's password. Make a note of this. Navigate back to the MySQL Databases page. Near the top you'll see a section titled 'Hostnames for this MySQL server'. Look for the hostname that corresponds to your website. It most likely has the website's name in it. To the right of the hostname is a link titled phpMyAdmin. Click this link to open the phpMyAdmin login page. You can also use the official phpMyAdmin hostname of your data center. First check the Data Center page. Scroll down to locate the data center your MySQL services are located in. It's either West coast or East coast. You can then use the following hostnames to connect depending on the location of your MySQL server. In the phpMyAdmin prompt, enter your hostname, username, password, and click Go. Point your A record to your DreamHost IP. View the DNS article for details on how to retrieve that IP address. Article last updated April 09, 2019 19:25 PST.